Now that the iOS 12 (public beta) is available with latest features and smooth functionality, there is no point of stagnating yourself into old iOS versions. As you may know, Apple releases timely updates to their operating systems and iOS 12 is their latest version (which is available as a public beta version as of this writing). After an iOS update, you will be able to enjoy a seamless functionality and better security on your iDevice. However, as a smart iOS device user, you should backup iPhone before update takes place. Although it sounds like a no brainer, a surprising number of iDevice users don’t backup iPhone before update. The consequences of disregarding the importance of backup can be pretty devastating. The purpose of this article is to explain the importance of creating a backup before upgrading to iOS 12 and the free ways to do it. Part 1: Do I Need to Backup iPhone before Updating to iOS 12? Many novice iPhone users often asked “why do I need to backup my iPhone before updating to iOS 12?”. Here’s why you should do it. Due to a failed iOS upgrade your files can be gone for ever. You may accidentally delete some files before an iOS update. iOS 12 is still available as a public beta and there may be a slightest chance for it to make your device unstable (it is a very rare instance though). Our general advice is that it is better be safe than sorry. As we mentioned before at the beginning, we are going to explain 3 free ways to backup iPhone before update. From this point onwards, we explain those free methods for you to try. As the first free method, we explain how to backup iPhone using iTunes (which is a tool offered by Apple itself). Launch iTunes and get the device connected to the same computer. If prompted, you should provide the device’s passcode. If the process asks you to Trust This Computer, just follow the steps displayed on screen. When iTunes asks, you should select the iOS device (iPhone, iPod or iPad) you are using. Now, click on the option called Backup Now in order to create the backup. At the end of the process, you will be notified with a message on Summery Screen. iCloud is another tool (service) offered by Apple itself in order to address a large range of issues. Since it is a built-in feature, many individuals tend to use iCloud with more confidence. Moreover, this respective method is compatible with all the iOS devices you use. Now, let’s take a look at how to backup iPhone before update using iCloud. As the first step, you should connect your device to a Wi-Fi network (many users consider it as a disadvantage though). Now, tap on Settings, your name and select iCloud option. However, if you use an older version (10.2 or earlier) you should Select the Settings option and scroll down to find the iCloud option. Now, select the option called iCloud Backup. If it is an older version, simply select Backup. Be sure that iCloud backup is enabled. Now, you should select the option called Back Up Now. Be sure that your device is connected to the Wi-Fi network until you get the backup done. The progress of the process can be monitored and Confirm at the completion of the backup. To check it, you should tap on the Settings, your name and iCloud. 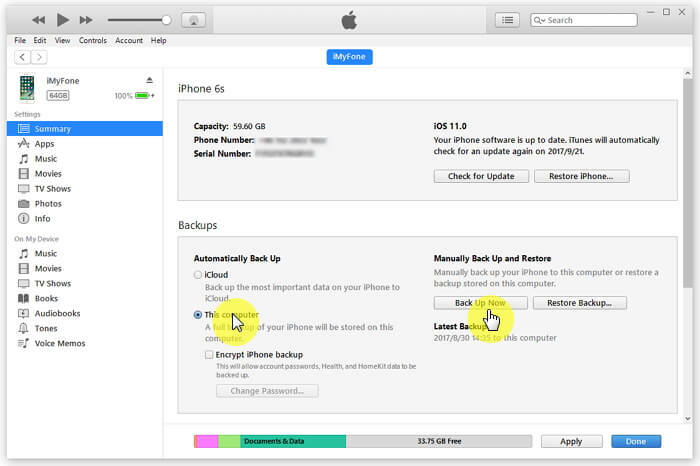 Under iCloud Backup, you will be able to see the option called Back Up Now. Check the date and time of the last backup. You can even consider creating an automatic backup with iCloud. This option will create a daily backup automatically. 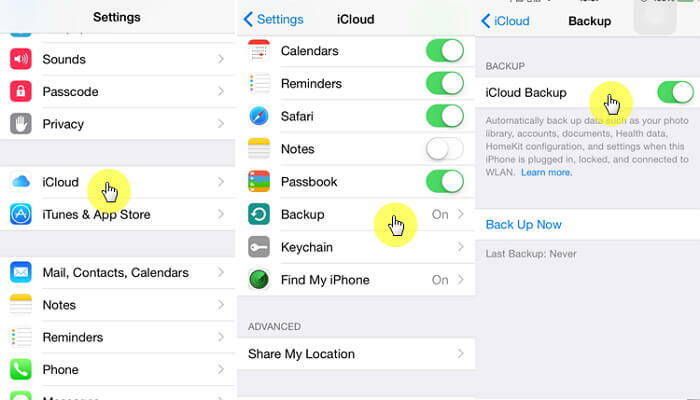 Here’s how to do it: Go to Settings -> select your name -> iCloud and then select iCloud Backup. Then, turn the iCloud backup on. Now, we are going to introduce the most efficient and powerful method to backup iPhone before update. In this case, we will be using a tool called iMyFone iTransor. iMyFone iTransor is an exceptionally powerful tool that can help creating iPhone backups successfully. Moreover, this tool doesn’t require an internet connection to create backups. Here are some of the most significant features associated with iMyFone iTransor. This is a superb alternative to iTunes in order to create selective backups. It can create selectively backups of data such as SMS, Contacts, WeChat and WhatsApp. 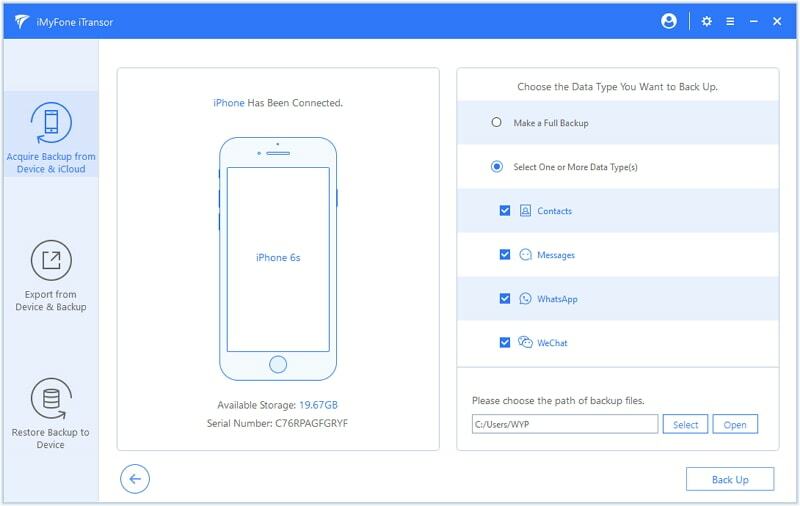 It can also selectively restore data such as SMS, Contacts, WeChat, WhatsApp through sources like iCloud, iTunes and iMyFone backup without creating any data loss. It supports all the iOS device including the latest iPhone Xs/Xs Max/Xr/X/8. Download iMyFone iTransor and get it installed on your computer. Select “Acquire Backup from Device & iCloud”. Click on Back Up Device. Connect the iOS device to the same computer so it will recognize the computer and trust it. Select one of the two options; “Make a Full Backup” or “Select One or More Data Type(s)”. Click on the option called Back Up to complete this process. If you need use other fucntions, you should purchase it. Backup iPhone before update is a very important aspect in order to prevent potential data losses. Although the chances for iOS updates to fail are minimal, it is always better to be safe than sorry. You can try the above methods we mentioned and create backups before upgrading your device into iOS 12. We appreciate if you can leave a comment below about your experience.